Polar mesospheric clouds (PMCs) occur in both hemispheres near the summer solstice at high latitudes and altitudes near the mesopause (~82 km) [e.g., Alpers et al., 2000]. From the ground these clouds appear in reflected sunlight against the twilight sky. 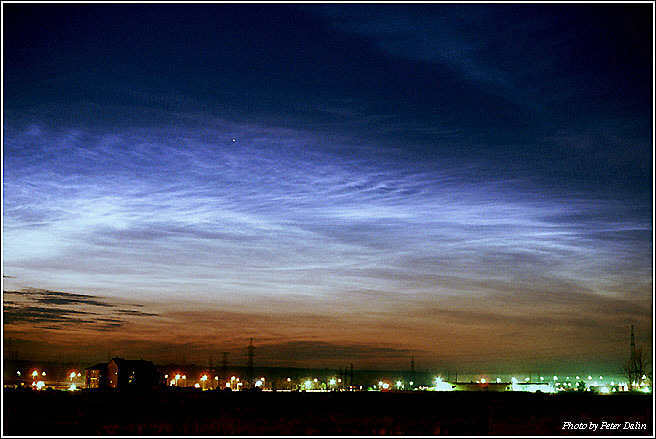 These sightings can be brilliant, leading ground-based observers to call them noctilucent or �night-shining� clouds (NLCs) (Figure 1). Wegener  was the first to suggest that these clouds could be composed of water ice, and this theory has persisted because PMCs have been associated with ice supersaturations and because their growth appears to be an exponential function of temperature [e.g., Rusch et al. 1991; Lübken et al., 1996]. Until now, this assertion has remained unconfirmed by observation because PMCs had only been measured at ultraviolet to near-infrared wavelengths where particulate spectra are void of unique absorption features or �fingerprints.� PMCs were measured in the infrared for the first time by the Halogen Occultation Experiment (HALOE). PMC extinctions retrieved from HALOE measurements at eight wavelengths show remarkable agreement with model spectra based on ice particle extinction (Figure 2). 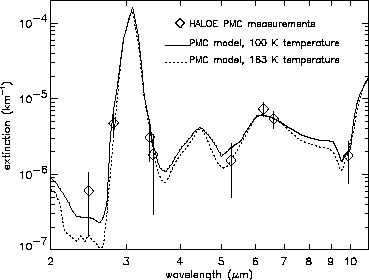 The infrared spectrum of ice has a unique signature, and the HALOE-model agreement thus provides the first physical confirmation that water ice is the primary component of PMCs [Hervig et al., 2001]. Figure 1. Noctilucent clouds photorgaphed by Pekka Parviainen in Finland (top) and Peter Dalin in Russia (bottom). Figure 2. HALOE PMC extinctions compared to modeled extinction spectra. The HALOE data are averages based on 16 PMC measurements from July 25 to August 4, 1997, between 62°N and 72°N latitude. Vertical bars on each HALOE point represent the standard deviation of these measurements. Model spectra were calculated using the average PMC size distribution from von Cossart et al. with ice refractive indices from Bertie et al. for 100 K temperature, and from Toon et al. for 163 K temperature. The model spectra were scaled to match the HALOE extinction at 6.62 mm wavelength. These scale factors were 0.76 and 0.65 for results based on the Bertie et al. and Toon et al. indices. Alpers, M., M. Gerding, J. Hoffner, and U. von Zahn, NLC particle properties from a five color lidar observation at 54°N, J. Geophys. Res., 105, 12,235-12,240, 2000. Bertie, J. E., H. J. Labbe, and E. Whalley, Absorptivity of ice I in the Range 4000-30 cm-1, J. Chem. Phys., 50, 4501-4520, 1969. Hervig, M. E., R. E. Thompson, M. McHugh, L. L. Gordley, J. M. Russell III, and M. E. Summers, First confirmation that water ice is the primary component of polar mesospheric clouds, Geophys. Res. Letters, 28, 971-974, 2001. Lübken, F-J., K. H. Fricke, and M. Langer, Noctilucent clouds and the thermal structure near the Arctic mesopause in summer, J. Geophys. Res., 101, 9489-9508, 1996. Rusch, D. W., G. E. Thomas, and E. J. Jensen, Particle size distributions in polar mesospheric clouds derived from solar mesosphere explorer measurements, J. Geophys. Res., 96, 12,933-12,939, 1991.
von Cossart, G., J. Fiedler, and U. von Zahn, Size distributions of NLC particles as determined from 3-color observations of NLC by ground-based lidar, Geophys. Res. Lett., 26, 1513-1516, 1999. Wegener, A., Die Erforschung der obersten Atmospharenschichten, Gerlands Beitr. Geophys., 11, 102, 1912.